1. Magnifying mirror. Because objects seen in regular mirrors are really larger than they appear. The little hair chin – that is actually two inches long, the stray brow – which is actually creating a bridge across your nose, that cute freckle – that is actually a smear of lunch’s BBQ sauce. Caveat: you should have a double sided mirror where the other side is not magnified. Make sure you leave it on the normal side until you’re ready to get serious about the face search – I have scared the heck out of myself more than once by turning on the bathroom light and having that jumbo magnified face staring back at me! 2. Truthful lighting. You’re not doing yourself any favors by having soft lighting that makes you appear to be bathed in the glow of a candle. You are setting yourself up for a heartbreaking double-take when you catch a glimpse of yourself in the rearview mirror as you head off to face the world with a make-up job that wasn’t intended to see the harsh light of day. 3. Fierce toenail clippers. The kind that don’t take “no” for an answer. Have you seen the kind with scissor-like handles? Better aim with less slippage. 4. Serious tweezers. “Cute” doesn’t cut it here. You want tweezers with a sturdy grip and a slanted edge – tweezers that can take on the tough tasks and get the job done. Keep them somewhere close to that magnifying mirror. 5. Soothing body powder. You will want to use this anywhere that skin touches skin that it didn’t touch previously. Please don’t make me be specific here. 6. Paper and pen. For when that “must do later today” flashes through your mind – because you will NOT remember it by the time you get to the kitchen. 7. Aquanotes. It’s a pad and “pencil” that sticks to the wall of the shower. Because the chances of you remembering that great idea long enough to rinse off and get to your paper and pen by the sink keep getting slimmer. 8. Extra eye or reading glasses. So on a groggy middle-of-the-night visit you can grab them quickly to determine what that large object on the floor actually is – and whether your sudden shaking is making it seem to be moving . . . or worse. 9. Counter-top pump body lotion. If you can fit your body lotion in a drawer, you’re probably not using the volume of moisturizer on your arms, hands, elbows, feet, knees – among other areas – that you should. 10. An object that makes you laugh, smile, or feel inspired. A whimsical shower curtain, a silly toilet paper dispenser, a framed motivational saying. Other than your bed, chances are the bathroom is the first place you go* in the morning and the last place you go* at night. Might as well begin and end each day with a smile on your face! 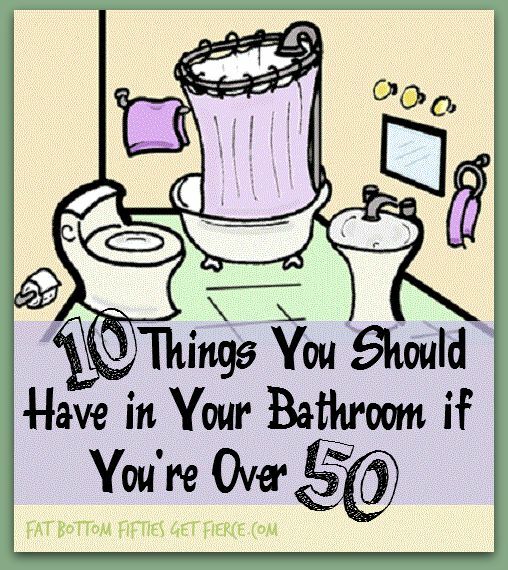 What’s YOUR now-that-I’m-over-50 bathroom staple?